BUNDABERG has been buzzing with fun events recently, and it's good to see. Bundy often gets a bad reputation, especially among the younger generation, for having nothing to see and do. But you only need to look around to see local people making a difference and often for a good cause. 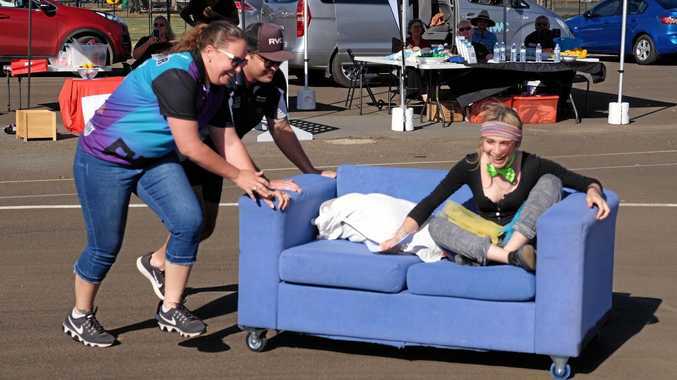 The Family Fun Day at Elliott Heads is one great example of the community coming together to both have fun and lend a helping hand to a local organisation. Surf Life Saving Queensland benefited from the event, while about 50 kids and their families had a great day in the outdoors. That's okay for kids and families, I hear you say, but what about young adults? Friday's concert at the new One Nightclub featured interstate band the Potbelleez, and it was a great show plus later this week, US rappers D12 will take to the stage - beat that, Brisbane. And for all ages there are Australia Day events galore on the calendar - the Innes Park Neighbourhood Watch Australia Day Carnival will put on a full day of family fun with all things Australian - from Aboriginal art workshops from indigenous artist Roger "Bushfire" Saunders to a display of whip cracking by the Barr family champion leather plait maker. The Aussie activities in Alexandra Park come Thursday will culminate with the Australia Day awards and a citizenship ceremony at which 26 new residents will be welcomed. And that's just two of the many events planned for around the region. It's great to see so much happening, get out and enjoy!